Finally the grid/box that we created to have an online version of Crema seems to be stable. Time has come to do a proper test. The server (once again Miguel's server) will be open without password. Hopefully we will have a full grid. If the server will be full and some of you will be out, we could try to set the server to allow more partecipants, and see if the server will still perform on heavier load. Let's push the server to the limit!!! Only in case we will have problems we will set a password for allowing only us in. Thanks a lot to Miguel Garcia that give a permit to use the BIG SERVER!!! Thanks a lot for joining our first official race in Crema! I saw two very nice races on an extremely reliable server! Of course 12 drivers is still not enough, but...not even a blinking car (at least for me) or any small lag! I'm really happy about it! On the track I had a wonderful 1st race, until lap 11, when I decided to see the pitboard to understand in which position I was, and who I was battling with... but...I keep on looking too much and I missed the braking point and I went straight to the wall on the first corner. shame on me! My second race ended even before: second corner! Someone touch me hard, and my car was too damaged to continue. It's a pity, but could happen! 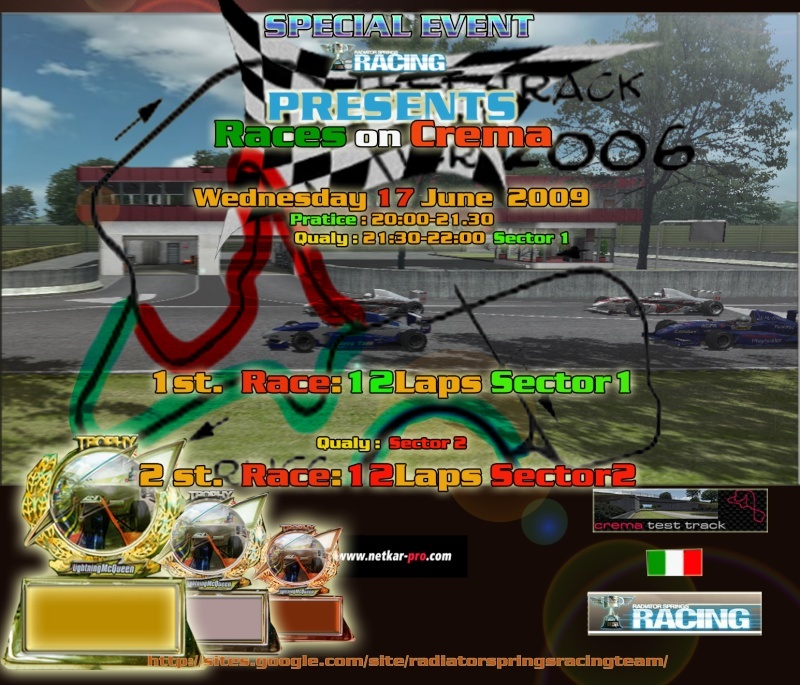 1) do you see any improvements on Crema track? Is the grid alligned correctly? is there space enough between cars on the grid? what about the pits (here unfortunately there is no more space available, so...I hope is fine)? and the (evil) pitboard? is it visible enough? should we move it backwards? 2)What do you think about race in FULL MODE? what is you preference for the championship races? Is it really worthed? I open a poll...please let us know. It was a very good event for me. I took a lot of fun. Grats to A. Canzi. He maded nice and consistent race. For me the spacing between the car in pit or on the starting grid is too tight. I have a version with more space if you want. we know that track is not for race in original mode and we must accept some inconvenients for race on it. Stephane Migrouille wrote: For me the spacing between the car in pit or on the starting grid is too tight.